Please indicate number persons 18 and over, number under 18, and number under 5 in your group. Include your mobile/home contact number and indicate your preference for contact. i.e. email, phone or post. Bookings are Saturday to Saturday unless otherwise stated. Will consider splitting up week out of School Holiday periods. 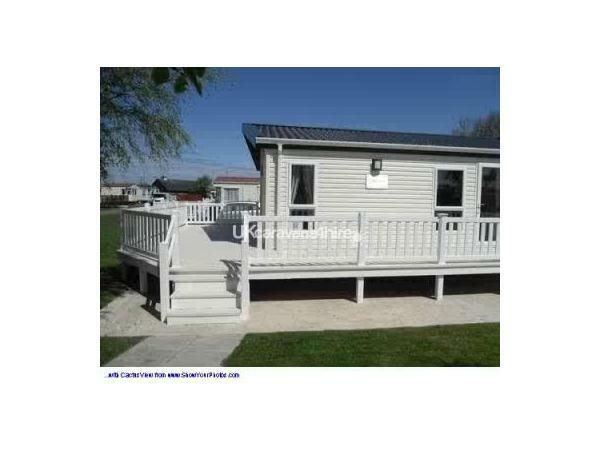 A Willerby Boston Lodge situated on the Golden Sands Holiday Park in Kinmel Bay, North Wales. 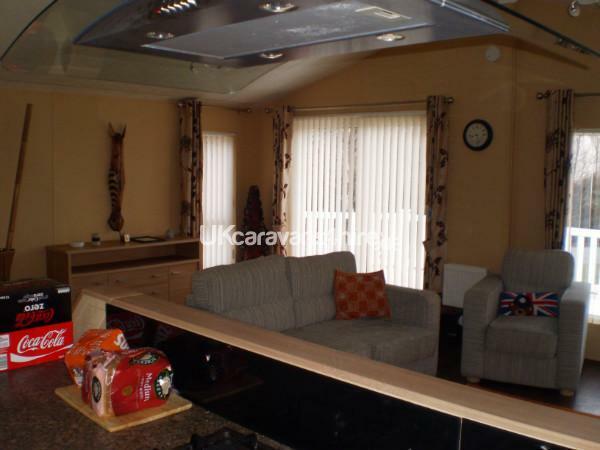 The Lodge is a 2010 model sleeping up to 6 persons using the double futon bed. Lodge measures 40ft x 20ft. built to residential specification with condensing combi boiler and fully central heated and double glazed. The accommodation is as follows. 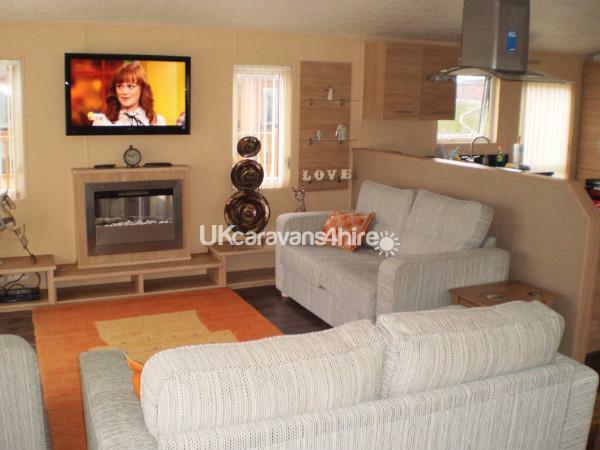 Sliding Patio Doors, Two 2 seater sofas and single armchair, double futon folds out to double bed. Cloakroom. Dining table with High backed chairs. A 40” freeview TV and DVD player. HiFi system. High line cooker station with oven and grill, stainless steel gas hob with 5 burners, integrated full size fridge freezer, washer, microwave, Oven and sepaerate grill, and dishwasher. 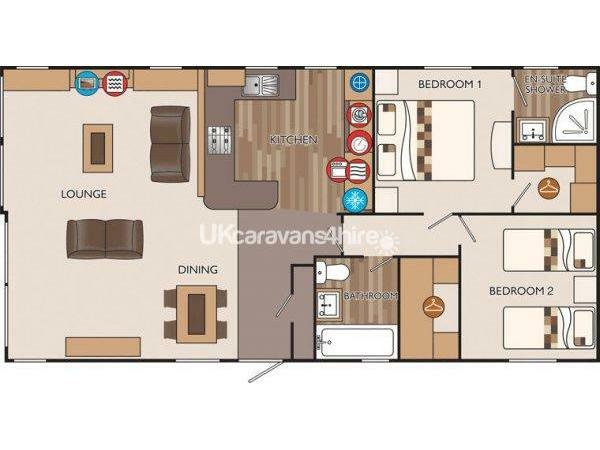 King size bed, ensuite shower room and walk in wardrobe with hanging rails and drawers. 40" Freeview TV. 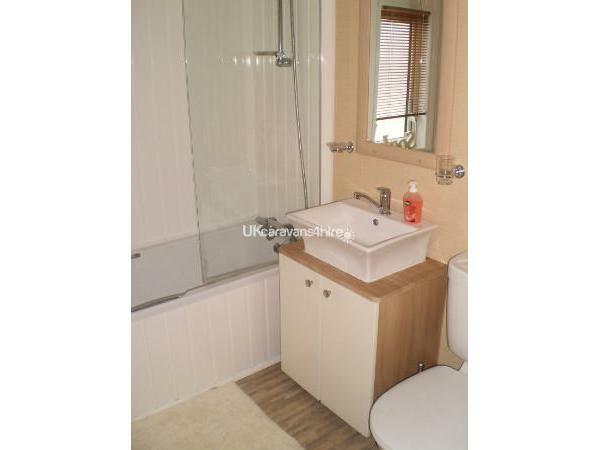 Ensuite consists of Quad shower cubicle with thermostatic shower, Porcelain sanitary ware. 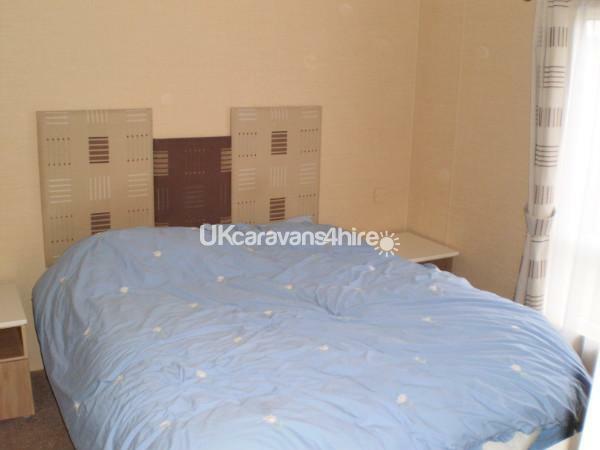 Twin 3ft single beds, walk in wardrobe with hanging rails and drawers and bedside cupboard. 21" Freeview TV with integrated DVD player. 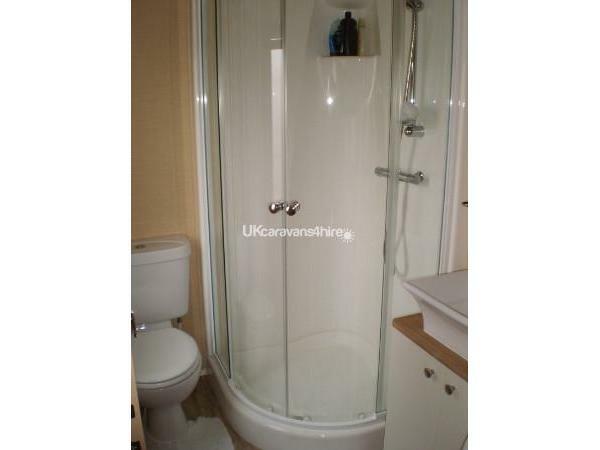 Bath with overhead thermostatic shower, porcelain sanitary ware. 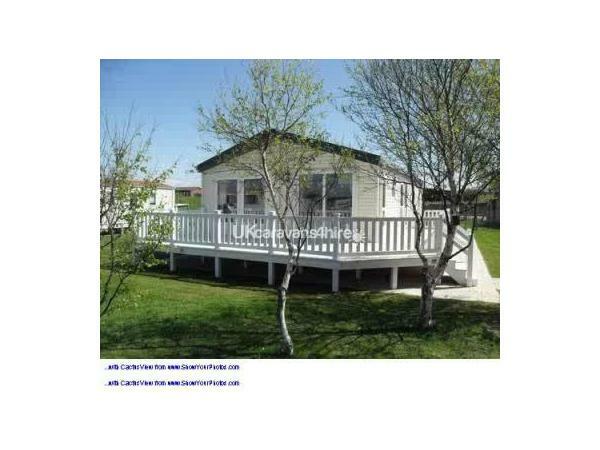 Large substantial decking area, six bistro chairs and small table provided. Large grassed area to side. Parking for two cars directly in front of Lodge. Provisions in the Lodge for your use. There is a full range of crockery, cutlery & mugs. A kettle, Iron, toaster and vacuum cleaner are provided. Gas and electric are included in the cost of your holiday. Duvet and pillows are provided. ** However you will need to bring your own towels** NEW FOR 2019 CLEAN LINEN WILL BE PROVIDED FOR BEDROOM 1 AND BEDROOM 2. 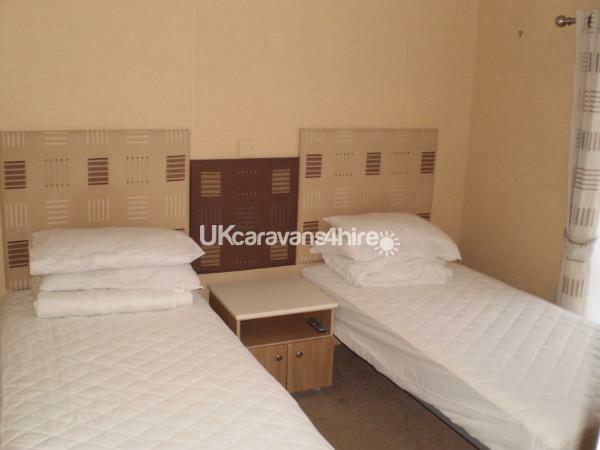 YOU WILL HOWEVER NEED TO BRING ANY EXTRA LINEN IF MORE THAN 4 GUESTS USING THE DOUBLE FUTON BED. 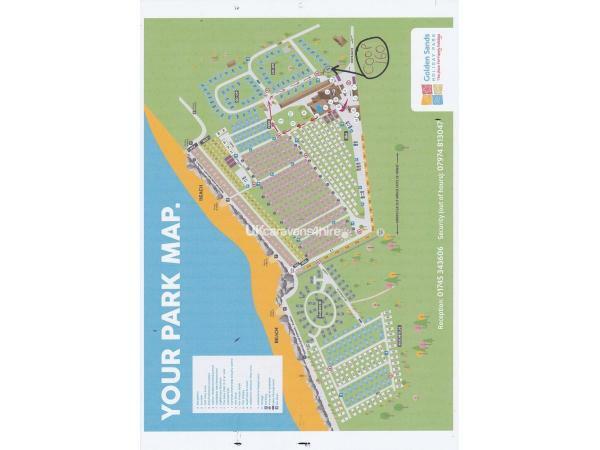 On the site is a children’s’ play area with modern play equipment, an enclosed football area and kids entertainment provided by gold star staff. The on site entertainment consists of two clubrooms with family entertainment, an arcade, launderette and indoor Pool. There is a free on site cash machine and WIFI is available for free inside two clubrooms and available in Lodge at a cost. Reception will give details of this. There is a small on site supermarket selling bread papers and groceries and those essential toys, buckets and spades etc. There is an on site chippy. There is free wifi inside the club. Within walking distance by the site entrance is an Indian takeaway/restaurant. There is an ASDA supermarket within a 15 minute walk and local shops with a Chinese takeaway/restaurant. 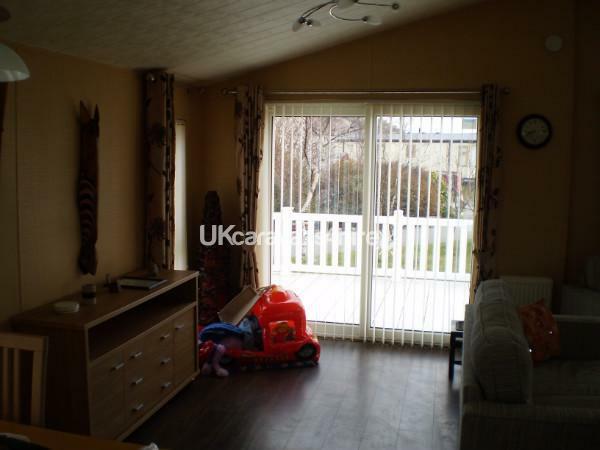 There is a market at weekends a 10 mins walk away in nearby Towyn where there are further bars, funfair's, amusement arcades, cafés, shops and a local bakery. From 2015 a £100 security bond (deposit) secures booking. (Non refundable if holiday cancelled) Full cost of holiday payable on top within 6 weeks of holiday arrival date. Security BOND returned after departure providing caravan left clean and tidy and no damage or breakages have occurred. On full cleared payment of your holiday (six weeks before your arrival date) you will be sent a Holiday Guest form to your provided home address or via email. On arrival at park you present the guest form at reception. You will then be presented with the keys for the Lodge and be required to pay for Registration which is for covering cost of passes, general park maintenance including security, park cleaners and park administration. Every guest is required to pay the registration fee regardless of whether they use the facilities or not. This is NO SMOKING Lodge, any evidence of smoking OR VAPING in the Lodge e.g. smoke smells, ash, cigarette butts will result in forfeiture of the SECURITY BOND. Smoking OR VAPING outside the Lodge on decking is OK, please use ashtrays. YOU ARE NOT ALLOWED TO BRING ANY PETS. ONLY OWNERS ARE ALLOWED PETS ON THE SITE. each PET IS REGISITERED AND HAVE PARK IDENTITY TAGS. You may not arrive earlier than 2pm on arrival date unless a prior agreement has been made. This is to allow sufficient time for the Lodge to be cleaned between lets. On departure date you must vacate the Lodge by 11am. When booking Lodge a £100 security bond must be made to secure the booking. This also acts as your deposit. 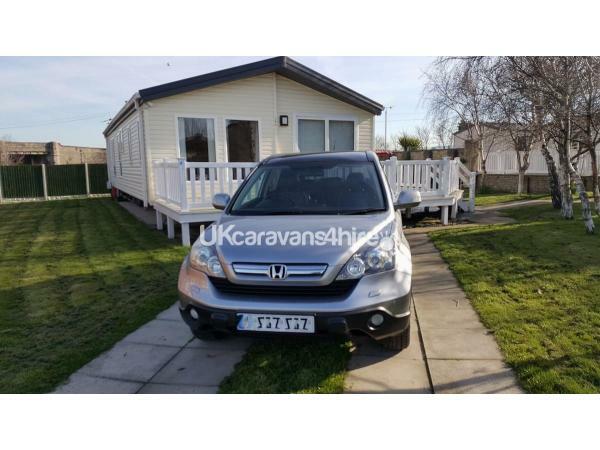 This security bond is not included in the cost of the holiday hire. OUT SEASON- Midweek £75 per night. 3 NIGHTS £25 DISCOUNT. 4 NIGHTS £50 DISCOUNT. WEEKEND (Friday to Monday) out of season min of £175 for 2 nights. Also APP now available. search App Store or Google Play for the ‘ONPARK’ app.